A 59-year-old diabetic man with prior transmetatarsal amputation presented with foot erythema and malodorous ulceration. 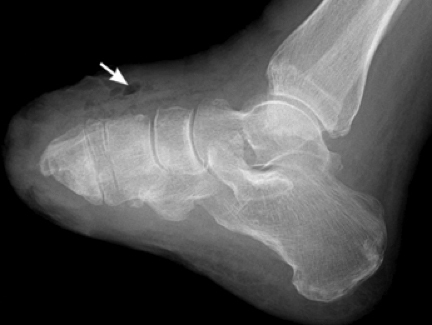 Subcutaneous emphysema was noted in the soft tissues along the deep fascia of the dorsum of the midfoot on radiographs (arrow, A). Subsequent CT examination demonstrated similar findings (arrows, B), as well as gas within the medial cuneiform bone marrow (curved arrow, B). The patient underwent emergent guillotine amputation. Pathology demonstrated gangrenous necrosis, necrotizing cellulitis and fasciitis, abscess formation, and osteomyelitis. Cultures showed a polymicrobial infection. Necrotizing fasciitis is characterized by necrosis of the subcutaneous tissues and fascia. Its incidence has been increasing due to an associated increase in the number of immunocompromised patients and conditions. 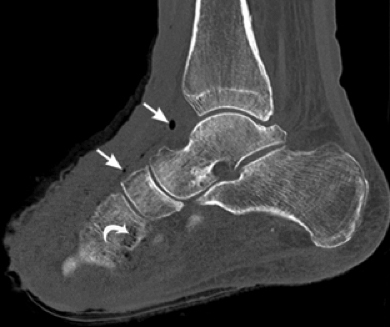 Diagnosis is suggested when gas accumulations produced by aerobic and anaerobic infection are identified on radiographs and CT. Necrotizing osteomyelitis is a rare aggressive process that occurs in immunocompromised patients. The infectious process may spread to bone hematogenously or from extension of an extraosseous infection. Intraosseous gas is virtually pathognomonic for emphysematous osteomyelitis, particularly in the extra-axial skeleton. In rare cases, the differential diagnosis also includes trauma, postsurgical change, lymphangiomatosis, degenerative disease, osteonecrosis, and neoplasm. Aggressive debridement and antimicrobial therapy are the mainstays of treatment for both necrotizing fasciitis and osteomyelitis. Since coexistence of osteomyelitis may alter medical and surgical therapy, however, early diagnosis is essential to guide treatment and decrease morbidity and mortality. Chaudhry AA, Baker KS, Gould ES, et al. Necrotizing fasciitis and its mimics: what radiologists need to know. Am J Roentgenol 2015;204:128-139. Luey C, Tooley D, Briggs S. Emphysematous osteomyelitis: a case report and review of the literature. Int J Infect Dis 2012;16(3):e216–e220. Edelstein Y . 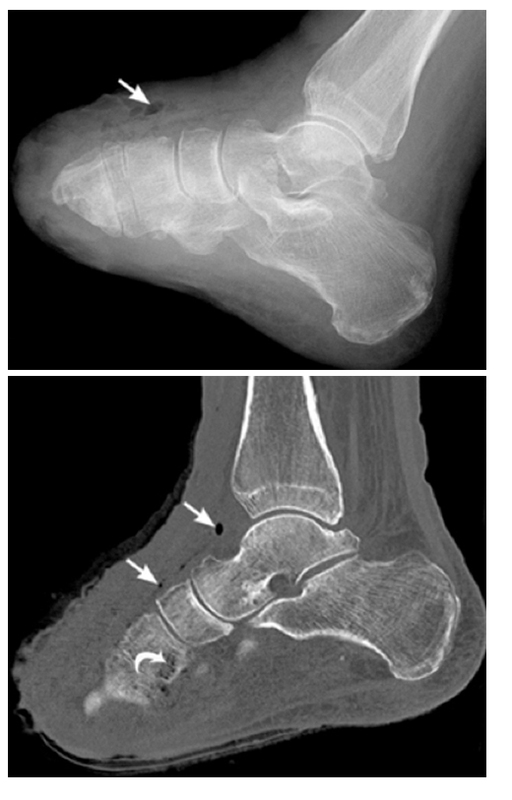 At the Viewbox: Necrotizing Fasciitis and Osteomyelitis. J Am Osteopath Coll Radiol. 2015;4(4):26. Dr. Edelstein works with the Northport VA Medical Center, SUNY Stony Brook Medical Center, NY.